I have my steering removed from my boat . It is not a standard system, its an old OMC thru hull that uses that bronze ball and clam shells where it enters through the transom. I have the cable out to replace the seal in the clam shell and I would like to inspect it further while I have it out to make sure the inner cable is in good shape. Here is where I am hung up . There is some type of crimp on the rod (helm end) that I can not figure out how to remove , I can just simply cut the crimp off and have something fabbed up in its place afterward , it appears to be some type of swage crimp. Ideally I would like to grease the entire cable once I have it apart , and make sure it is sound. are there any tricks to remove this crimp ? How should I proceed ? I cant get pics to load otherwise I would post up my cable , the ideabook keeps timing out. before I get flamed too hard about just buying a new cable , they haven't been made in 30 years and I can not locate a new one. Last edited by REDRIG; April 13th, 2019, 08:56 AM. If they don't make such a cable anymore, and you can find anything with similar ends to fit, why not look at replacing the steering system to a more modern version with fresh new parts? Probably the best safest way to go about it in my opinion. Al Gore claimed to invent the internet, now we learn it was around way back in George Washington's era. Last edited by REDRIG; April 15th, 2019, 09:42 AM. I see what you are working with and that makes things a lot more interesting. You may have to think out-side the box ( I really hate that statement from work). If the outer jacket of the cable is still in good condition at the transom consider yourself lucky and leave it as it is. Some of the earlier PRE TRUE COURSE models that used the worm drive in the upper gear case were rigged with the same type of cable used on the outboards that was wrapped around a drum turning the through intermediate housing shaft with a rope style helm and pulley system. Early 60s. 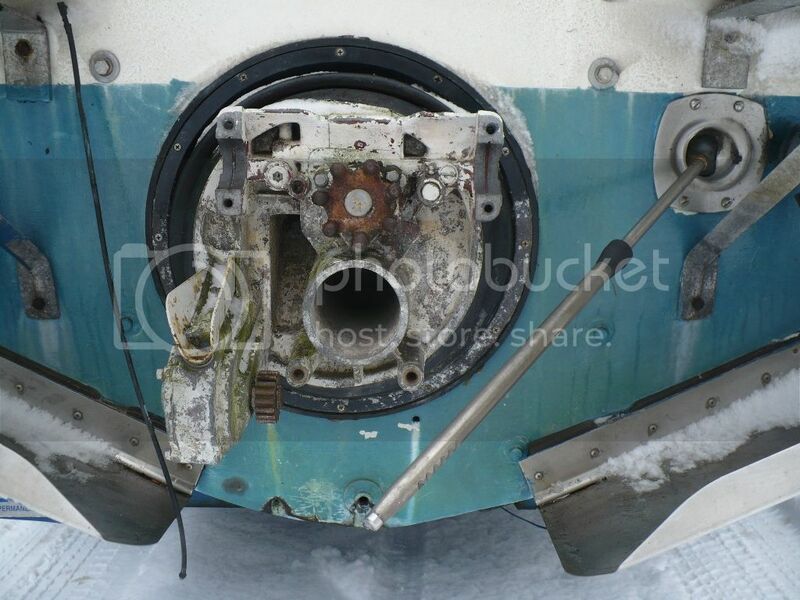 There was a system that used a Teleflex Big T head on the transom end with a jackshaft and gear arrangement that drove the through intermediate shaft. Looking at the rear of your boat really brings back some memories! One other thing that you should try is to get a large pipe wrench and try to rotate the lifting gear to free up the clutch pack by lifting up on the wrench. There is a tool that is made for this but trying to get one would be hard. Do not try to push down on the wrench or you will push the rear worm plug out. If the clutch pack is not able to slip it can cause either the worm shaft drive pins to shear off or wring off the end of the tilt motor shaft. Thanks for the response Kenny , yeah I am lucky as far as I can tell the cable is in great shape , the jacket is not split anywhere or anything like that . I was mainly curious how easily they came apart so I could actually see the cable and make sure its not frayed or anything , and then grease it up good and reinstall. There is a YouTube video by dangar marine that shows a way to lube throttle and shift cables. https://www.google.com/url?sa=t&sour...N8ZFOD4xbU2nov He says it's not as effective for steering cables but is useable. Not sure if this will help you because I'm not familiar with your exact cable but it might at least give you an idea to work with..